This month we are shining a spotlight on one of our own Scenic Sotheby’s International Realty staff members and her volunteerism in our community. Shelby Thomas, the Director of First Impressions at our Destin office, believes in service and lives out that attitude through her involvement with the Junior League of the Emerald Coast (JLEC). 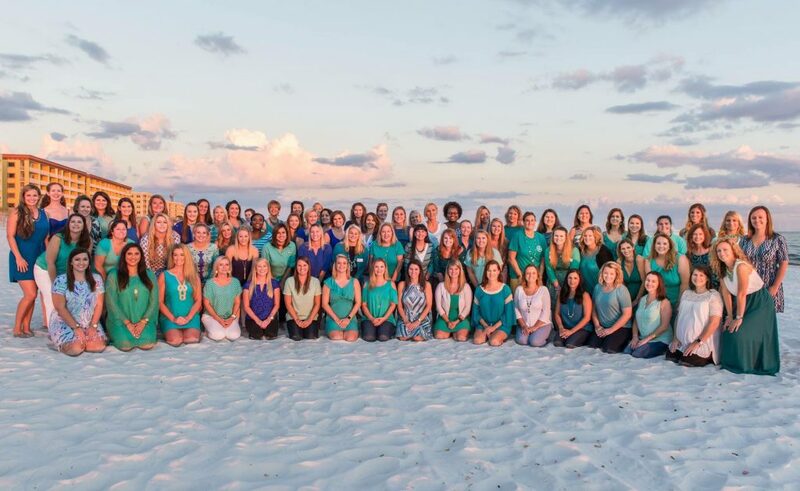 The JLEC is an organization of nearly 300 Northwest Florida Panhandle women of diverse backgrounds who engage in Community Impact programs dedicated to building the community. Every fall, the Junior League’s Child Clothing Project offers a complete wardrobe of shoes, socks, underwear, tops, a jacket or fleece, and pants to deserving children. The goal of the project, a signature community project for the Junior League, is to clothe 350 children in Okaloosa and Walton Counties. The event takes place over a two-day period in the month of October and is made possible with the help of not only the members of the Junior League, but also the volunteers from various schools and organizations in the community, as well as donors. Children from both Okaloosa and Walton counties are suggested by their schools’ guidance counselors to participate in the project. The students are required to be on the Free and/or Reduced Lunch Program which in Okaloosa County is 37.8% of elementary school children or 4,686 students and in Walton County, 46.3% of elementary school children, totaling 1,681 students. On the average, more than 30 schools participate in the Child Clothing Project. The children are bused to the local area Target where they shop for a new pair of shoes, socks, underwear, two short sleeved shirts, a jacket, a long-sleeved shirt, a pair of jeans, and a pair of active pants. All items are ones that they are able to pick out on their own. The Child Clothing Project is the main way in which Shelby participates in community service through the JLEC. She works both days of the Child Clothing Project each October and fundraises year-round. She shares the JLEC story with whomever will listen, asks friends and family and people she has just met to get involved. It costs $100 to sponsor a child. Shelby works about 50 hours a year on the Child Clothing Project, plus many more hours spent talking to people, explaining the JLEC mission and asking them to donate. Scenic Sotheby’s International Realty is proud to have community minded people like Shelby Thomas in the office and in the lives of children.